Each of Fallout’s five survivor types see something different in the mirror when they wake up in the morning, but each and every one of you is equally deserving of love (probably). That said, we’d like to begin by highlighting what makes you S.P.E.C.I.A.L., before you’ve even had anything to say about it! The Vault Dweller: You had no idea when you signed up for the vaults what they had in store, but as Luck would have it, you got out mostly unscathed. Now it’s up to the wasteland to finish what Vault-Tec started and really show you what post-nuclear life is like. The best part about your time underground? That slick Vault Suit featuring an armor point, a reroll on Endurance tests, and the ability to layer other Apparel over it. The Wastelander: This whole Wasteland business is old hat, right? You and your handy-dandy tire iron have been wandering for as long as you can remember, so you’ve got the power to destroy the little critters and the know-how to avoid the big ones. Don’t let your Agility go to your head, though. There’s still a lot to learn! The Super Mutant: Nobody really wants to be irradiated, but you’ve certainly learned how to make the most of it! While you still take radiation, you also gain XP whenever you do, making trips into the murky green areas of the world a bit more appealing to you. When Moira, the general store owner/author asks you to test what major radiation does to a person, you’ll be more inclined to comply than most of your fellow survivors. Not only that, but your time in the radiation has already given you superhuman muscle mass, meaning you start the game with Strength! The Ghoul: Much like your Super Mutant friend (or foe), you’ve learned how to adapt to the wasteland and take advantage of its post-nuclear state. It’s unfortunate that your prolonged exposure to the airborne chemicals have lowered your HP, but on the bright side, rather than taking Rads, you actually regenerate health! With your Perception, finding those especially radioactive areas will be easy as pie. It’s getting there that will be the challenge for a Vilified unknown such as yourself. The Brotherhood Outcast: What did you do to get kicked out of the Brotherhood, buddy? Sounds like a story we’d love to hear sometime, but hey, either way, you got out with some awesome power armor. Those two armor points will come in handy when you’re fighting the biggest and baddest. Too bad it also slows you down a little… but you’ll figure out a solution. You are an Intelligent rebel after all! Not only do you begin with the items and skills inherent to your survivor, but you also draw one additional S.P.E.C.I.A.L. token at random before you begin your adventure. These tokens are placed along the S.P.E.C.I.A.L. track on your survivor board. As you play the game, you will face a variety of encounters and altercations where you will interact based on the tokens on your board. For example, if you have a weapon featuring the Agility icon, and you have the Agility token on your board, you can use that weapon to reroll in a fight. If you visit a location and one of the options features all seven S.P.E.C.I.A.L. icons, should you choose to take that action, you can reroll for each S.P.E.C.I.A.L. token you have! In order to obtain new S.P.E.C.I.A.L. tokens, you’ll need to gain XP and level up. Survivors gain XP primarily through winning fights—earning XP equal to the level of the enemy defeated—and completing quests, for which the XP reward varies. For each XP you obtain, you'll move the gray peg on your survivor board up to the next S.P.E.C.I.A.L. slot you have filled. Once you reach the end of the S.P.E.C.I.A.L. track, you level up! That means that with just the two tokens you start the game with, it takes three XP to level up. Once you have more tokens, you will need to do more to reach your next level. Whenever you level up, you'll draw two new S.P.E.C.I.A.L. tokens from the supply. If you have an open space that either token could fill, you can choose to take that token and gain its associated skill. However, if you draw a token you already have, you have the option to put both tokens back and select a Perk instead. Perks are powerful, one-time abilities associated with each S.P.E.C.I.A.L. skill. Well-worn Commonwealth adventurers will recognize these immediately, as they’re drawn straight from the Fallout 4 perk chart! There’s certainly something to be said for self-confidence, but really, what does all your success mean if nobody knows about it? Making waves in the wasteland requires power and clout, so you can’t just roam around doing whatever you please and expect to make a difference. Fortunately, the recipe for success is as simple as Crispy Squirrel Bits. Each survivor in the game begins with an influence card, offering a unique goal for them to strive toward. Some may be encouraged to join up with the power player factions, while others will be given more distinctive personal goals. For example, you may be tasked with obtaining as many S.P.E.C.I.A.L. tokens as you can, thoroughly exploring the board from top to bottom, or developing a reputation as a well-stocked, uncertified pharmacist, flush with wasteland chems (don’t try this at home, kids). Whatever path you choose to follow, you’ll have to stay nimble, prepared for any opportunity. This world favors a jack of all trades approach, so the more areas in which you can prove your value, the easier it will be for you to reach the pinnacle of influence and win the game! 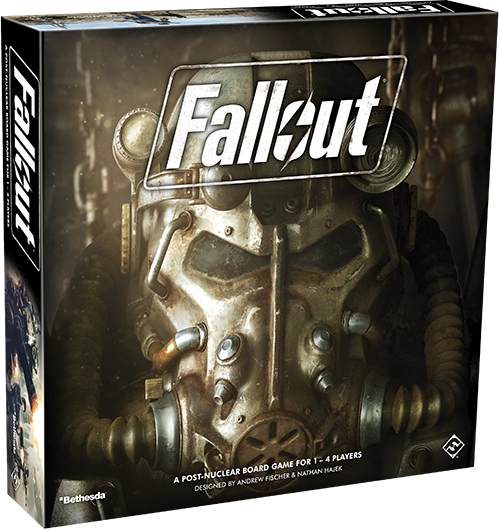 Fallout: The Board Game (ZX02) is available for pre-order at your local retailer or online through our website now!